The lovely Wendy Iriepa Díaz and her husband have traveled to the US to tell the truth about the way LGBT persons are treated in the country, but especially the Transgender population, as Wendy is a post-op transwoman legally married to Ignacio Estrada Cepero. For example, although some trans activists like to shame the US by saying that “even Cuba gives SRS for free,” according to Wendy only 20 surgeries have been approved in five years. I had to include the photograph below, because Wendy made such a beautiful bride. 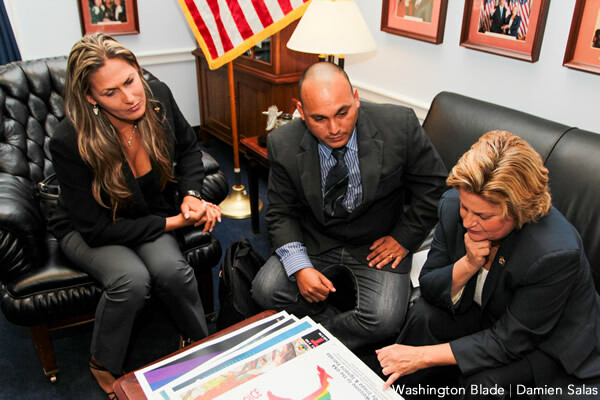 Florida congresswoman meets with Cuban LGBT rights activists : Washington Blade – America’s Leading Gay News Source. This entry was posted in Activism, Politics and tagged cuba, international on November 11, 2013 by .